The Galaxy Tab S4 offers one of the best tablet-based drawing experiences you'll find, and the inclusion of the S Pen when many rivals charge extra makes it more compelling. It's better as a tablet than a laptop, though. 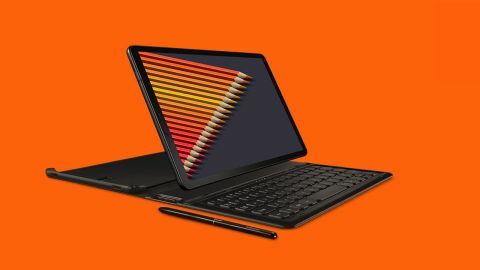 While Apple offers its premium tablet – the iPad Pro – in a couple of sizes and a variety of colours, Samsung is keeping things simple with this new, similarly priced device. The Galaxy Tab S4 just comes in one size, a 10.5-inch display, and you can choose between an austere grey or a glossy black body that’s so impenetrable you could almost use it to recreate the monolith scene from 2001: A Space Odyssey. So what's it like to draw and paint with? The answer for the Tab S4 is 'very good indeed'. The sensation of drawing is sublime, with just the right balance of smoothness and bite on the display. The S Pen (which is included in the price, unlike the iPad Pro’s Apple Pencil) features 4,096 levels of pressure sensitivity, and feels responsive as you sketch, moving from the lightest of strokes to heavy mark-making without a glitch. A discrete clip on the pen prevents the stylus from rolling when you set it down: a thoughtful touch. The pen also features a single shortcut button that’s so inset that it’s hard to locate it by touch – an annoyance if you tend to rotate your pen in your fingers as you draw. Sadly, the minimalist feel of the device design isn’t reflected in the Android operating system driving the Tab S4. It seems to get busier with each release, with a lengthy setup sequence offering piles of settings and optional software downloads, and early use interrupting your activity with tips and advice. The feeling of busyness isn’t helped by the new DeX mode, which presents an alternative interface more reminiscent of Windows running on a laptop. You can get an optional keyboard cover to clip on to your Tab S4 to complete the laptop transition. As might be expected from the first try, DeX on the Tab S4 doesn’t really compare with Microsoft’s Surface running Windows 10, which offers a far more sophisticated pairing of desktop and tablet interfaces. Right now Samsung’s Tab S4 is better at being a tablet than it is a laptop. And while the display is bright and colourful, its narrow 16:10 ratio won’t suit every artist. But these are minor quibbles against one of the best tablet-based drawing experiences you can find – and the inclusion of the S Pen in the package when so many rivals charge you extra makes the Galaxy Tab S4 a compelling option for creating art on the move. This article was originally published in ImagineFX magazine (subscribe here). Read more: 80 awesome Adobe Illustrator tutorials.